Prepare grill. Mix marinade, onion, syrup, orange juice, oil, garlic, and pepper in large bowl. Lightly score flank steak with knife. Place steak in shallow baking dish and pour 1/2 cup marinade over, reserving 1/2 cup. Cover with plastic wrap and refrigerate for at least one hour, turning once. Remove steak from marinade and discard marinade. Grill steak over medium coals, for about 15 minutes, turning once. Baste occasionally with reserved marinade. Place remaining basting marinade in small saucepan, keep on low heat and reduce. 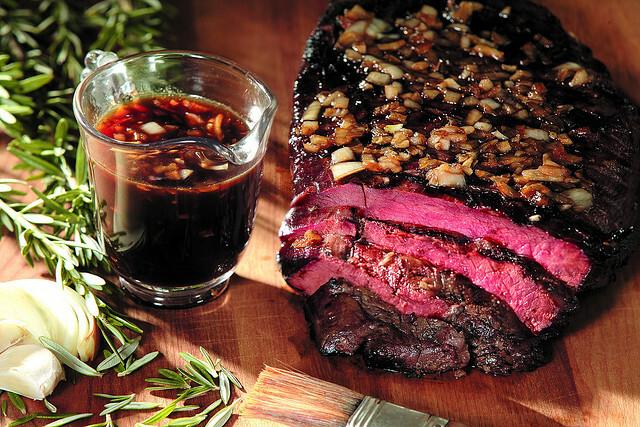 Serve steak with sauce and fresh rosemary sprigs. Serves four to six.